Division of Electronics and Applied Physics, Osaka Electro-Communication University. Keywords: Portable X-Ray Analyzer, Archaeology Study, XRF/XRD,Triple excitation X-Ray tube, Chemical structure. Recently the reduction of size and weight of X-ray analyzer is required because of the non-destructive analysis in archaeology studies et al., for field studies. The portable X-Ray fluorescence spectrometer (XRF) is powerful technique for qualitative and quantitative analysis. And also this spectrometer has already developed [1, 2]. However in this equipment, the element information only is obtained. Generally, not only element information but also crystal structure and chemical state information are required in this field. X-Ray diffractometer (XRD) is useful technique for the studies of crystal structure and chemical state analysis. Therefore in order to obtain both the information of the qualitative or quantitative analysis and the chemical state analysis or the crystal structure analysis for the samples, XRF and XRD components have to be combined in X-Ray analyzer. Figure 1 shows the schematic design of the portable X-Ray analyzer combined XRF and XRD. The analyzer is consisted of one air-cooled X-Ray tube and two detectors for XRF and XRD. The X-Ray tube and the detector for XRD are moved on circle-like stage depend on Bragg condition. Non-depending on the measurement of XRD, XRF measurement can be carried out everywhen using SDD (Silicon Drift Detector). Fig 1: Portable X-Ray Analyzer that is combined XRF and XRD.. In XRD measurement, it is very important to select one energy of the characteristic line as the incident X-Ray. The comparison of XRD spectra by means of the different detection method is shown in Fig. 2. In Fig. 2, top (a) is the result using the scintillation counter without the filter, middle (b) is the result using the scintillation counter with filter to eliminate the Kb line, bottom (c) is the result using Si-PIN which has energy resolution. In (b) and (c), there are large scattered X-Rays from the sample that depend on continuous X-Ray because of using the scintillation counter. In (a), only Ka line is selected in the diffracted X-Ray by using Si-PIN. Therefore the intensity of the diffracted X-Ray is not change, and the intensity of background is improved. Fig 2: Difference of diffraction pattern by the kind of detector. The triple target X-Ray tube is developed in this study. The schematic of the triple target X-Ray tube is shown in Fig. 3. The X-Ray tube has 3 metals on the anode material (Cu) as shown in (b). Each metal as X-Ray target is selected by the motor to change the emitted X-Ray energy. In this study, W, Ag and Cr metals are selected as the target. The X-Ray tube is operated within 50kV and 1mA. The size of X-Ray source is about 80mmf The X-Ray tube can cover the wide range of analysis element in XRF because of can excite the sample with the higher efficiency by means of three metals as the target. Figure 4 shows the exciting efficiencies of each element depend on the excitation X-Ray energy. In Fig. 4, it is clearly that the triple excitation sources are useful and effective. Table 1 shows the optimal detection element that depends on the excitation energy. Fig 3: The schematic of triple target X-Ray tube. Fig 4: Exciting efficiencies of each element. Table 1: Difference of an optimal detection element. In XRD, the triple target X-Ray tube is effective by following reason. In the field measurement, there is the mechanical limit of the goniometer to the low angle side and the specimens are almost mineral which 2d value is large. The measurement range of the analyzer in this study is from 35 to 85 degree. Therefore irradiation X-Ray wavelength must be long.Table 2 shows the measurement range of the 2d value to each X-Ray target. Table 2: shows the measurement range of the 2d value to each X-Ray target. Si-PIN detector because of showing the effectiveness of Si-PIN detector that has energy dispersion. It is shown clearly that the XRD pattern is fine in (b). The intensity of background is improved and the ghost peak by Kb line (marked by * in Fig. 5(a)) are eliminated in the case of Si-PIN. Fig 5: The effectiveness of Si-PIN detector. The measurement results of the raw material of pigment paints by portable analyzer are shown in Fig. 6. In usually, calcite, Gypsum and Huntite are used as the raw material of white paints. The chemical element is estimated as Ca, but the chemical condition cannot be judged with XRF measurement. However, the change of XRD pattern for the different powder depends on the chemical condition. Fig 6: The measurement results of the pigments paints by portable analyzer using Cr tube. Fig 7: The measurement results of the pigments paints by portable analyzer using Ti-target. The characteristic X-Ray wavelength of Ti target is longer than that of the Cr target. So the diffraction peak of the lattice by Ti-Ka line appears in a higher angle than that by Cr-Ka line. The peak that does not appear by Cr-Ka appears by Ti-Ka line. This is because of to be able to measure the lattice with large 2d value by Ti-Ka line with large wavelength. Furthermore the background is improved by Si-PIN detector. The measurement results of the raw material of pigment paints by the portable analyzer using Ti-Ka line is shown in Fig.7. The samples are Calcite, Gypsum and Huntite. The Ca composes in these samples. Only Ca is observed in XRF, therefore it is not able to distinguish the chemical condition. However in XRD pattern, the difference of each sample is clearly. Then the chemical structure of the sample can be distinguished easily. And the spectra of XRF and XRD using Ti-Ka fine than that using Cr-Ka. 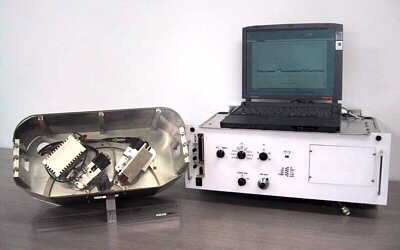 The portable X-Ray analyzer (XRF/XRD) has developed in this study, and also is shown in Photo 1. The portable X-Ray analyzer is consisted of the controller and the measurement probe. All systems of the controller are controlled by the lap top computer. The measurement probe is composed with the triple excitation X-Ray tube and the energy dispersion detector. The combined technique of XRF and XRD is very useful for the analysis to measure not only about element information but also about crystal structure and the chemical state information in field studies et al. Recently, the technical elements of X-Ray spectrometer are rapidly developed. In this reason, the miniaturization of the equipment advanced rapidly, and the microanalysis by means of very small amount and size becomes possible with the compact X-Ray fluorescence spectrometer. These compact XRF and/or XRD are becoming more and more important at outdoor or in situ analysis of various fields. Photo 1: Portable X-Ray Analyzer (XRF/XRD) . M. Hirai, T. Utaka, Y. Sako, A. Nisawa, S. Nomura and K. Taniguchi, Advanced in X-ray Analysis, 29, 93 (1998). T. Utaka, S. Nomura, T. Minobayashi, T. Ninomiya and K. Taniguchi, Advanced in X-ray Analysis, 31, 173 (2000).